Peak oil is a fundamental tenet of the Transition Towns concept, but the current return of “cheap oil” has muddied the waters about how to discuss it. 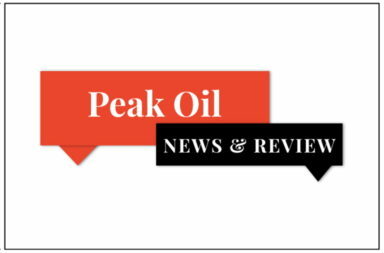 At a recent meeting of Transition Town Reading (U.K.), we discussed the prevailing low oil price, and the group asked me to put together some salient points on the subject, set within the context of whether or not we can now dismiss peak oil, e.g. as it is currently being contested here and here. The following points are based on an article that I wrote on this blog which was re-posted on Resilience.org here. (1) Peak oil is NOT when oil runs out, but it is the point at which the maximum rate of production of oil is reached, globally. Beyond the peak, global production falls relentlessly. New technologies can extend the supply, but the cost of production rises accordingly. (2) Peak oil is expected to happen as a result of geological/technical/ geopolitical factors, but it may also be that a very high price of production (mainly due to these factors) makes oil less affordable, reducing consumption, so production “peaks” for this reason. (3) Different nations/regions will peak at different times, but “peak oil” refers to the global maximum. (4) Over half of the world’s major oil-producing nations have passed their production peak. (5) The decline in production rate from existing oil fields amounts to a loss of 3.5 million barrels a day, per year. To maintain overall supply (around 30 billion barrels per year), the equivalent of a new Saudi Arabia’s worth of production must be brought on-stream every 3 years or so. (6) This (5) means that new production has to grow relentlessly, year on year, such that by 2030 (only 15 years time) we must install new production to the tune of around 5 Saudi Arabias. (7) It is not only the (large) total of the oil that must be produced (200 billion barrels by 2030), but [reinforcing (6)] that the production rate of the “new oil” has to increase relentlessly to meet the decline from existing conventional fields. (8) It is production rate that is critical, more than the size of the reserves. “The size of the tap, not the tank”. Of course, the oil has to be there in the first place, but it is how fast it can be got out of the ground that determines whether the overall global production rate can be maintained. (9) The conventional fields being found now tend to be smaller than they were. The 20 largest oil fields in the world account for 25% of total global oil production, of which the majority are already in decline. “Giant”oil fields (those containing 500 million barrels or more) currently provide 60% of the world’s oil supply, but their discovery peaked decades ago. (10) This means that most of the new production has to be from unconventional “oil” sources. These are more difficult and expensive to produce from, and have a lower energy return on energy invested (EROEI) than for conventional oil. This is likely to translate into lower production rates per unit of $ or unit of energy. (11) There is an inverse correlation between EROEI and $ price for different oil sources, i.e. lower EROEI, higher $ price. (12) Chevron have released a presentation for their investors [emphasising (10)] which indicates an expectation that 40% of the “new oil” will come from deepwater fields, 20% from U.S. shale, 10% from increased tar-sands production, 25% from OPEC growth (Venezuelan extra-heavy oil? ), and around 5% each from shale outside of the U.S. (Russia?) and “onshore and shallow offshore”. (13) Chevron also stress that production from these sources will not come cheap, and will probably be of the order of $100 a barrel (“Breakeven price” or “marginal cost”). (14) Hence at under $50 a barrel selling price, these projects will not go ahead, or they will be money-losers (cost more to produce the oil than it sells for). This year, $150 billion worth of new projects may face the axe, which are mainly from heavy-oil, deepwater, tar-sands and shale-oil. (15) Lack of new infrastructure now will mean a reduced production rate, a year or so down the line. (16) So why is oil so cheap? There are various contributing factors relating both to supply (production rate) and demand. The main supply factor is that production of U.S. shale oil has increased rapidly to 3.5 million barrels a day, along with the renewed oil production from Iraq and Libya. Saudi produce one third of OPEC’s output, and this time they have refused to cut production because they want to keep (grow?) their share of the market. (17) At the same time, demand has fallen because the global economy (especially China) has slowed down. Since everything we do uses oil, when an economy is strong the demand for oil goes up, and when the economy weakens, demand goes down. (18) The result of (16) and (17) is a glut of oil. According to supply/demand considerations, the price goes down. It only takes 1% or so, in undersupply or oversupply, to push the price of a barrel of oil to above $100 or (as we have seen recently) down to $50. (19) So, can we now forget about peak oil? No. Due to (5) and (14/15), the oversupply of oil will peter out. We still have the background global decline rate, so needing to produce a new Saudi every 3 years, and from unconventional oil, which is more difficult, tends to have a lower net energy return, and is expensive. Due to the current low oil price, new infrastructure is now not being built, meaning a further loss in production a year or so ahead. (20) Then the price will then go-up again (supply/demand). But it has to, or producing much of the oil that is left would be a money-loser. The price has to go above the breakeven price (cost of production) for new investment to be worthwhile. (21) The only way the price could maintain a sustained low is if the global economy continued to slow, so the demand not only didn’t grow but actually fell. This, naturally would have its own adverse consequences. If the price were to rise massively, e.g. to $150-200 a barrel, oil would become increasingly unaffordable, which would also reduce demand. (22) So long as the selling price of oil stays above the“shut-in” price, existing production will mostly continue. If, however, it were to fall below this level (say, $20 a barrel), much global production would actually lose money, and be shut-down. This might reduce the world oil supply rapidly and massively, to the point that the world economy would stutter, and restarting both the oil production and the economy in its wider sense, might prove extremely difficult (worst case scenario!). (24) While the return of a sufficiently high price may encourage new investment, it is unlikely that we can grow production of new oil to equal five Saudi Arabias within the next 15 years, especially from sources that are more expensive and more difficult to produce from than the oil they must serve to replace. Therefore, we can anticipate a contraction of the global oil supply within this timescale. One day we will run out of oil, it is not today or tomorrow, but one day we will run out of oil and we have to leave oil before oil leaves us, and we have to prepare ourselves for that day. The earlier we start, the better, because all of our economic and social system is based on oil, so to change from that will take a lot of time and a lot of money and we should take this issue very seriously." (26) There is the climate-change aspect too, since burning oil contributes around one third of the carbon emissions that are due to human activities.